Have no fear–I didn’t forget about this project! Aired Nov. 14, 2012, on TBS. This recap contains spoilers for the drama and the manga. Episode 5 recap here; manga analysis here; Ôoku category (film, manga, and drama) here. This episode corresponds to Vol. 3, Ch. 3 in the manga. At the preparations for the small feast to be given in honor of the birth of Iemitsu’s (TABE Mikako) daughter Chiyo (not technically her heir as of yet), Arikoto (SAKAI Masato) oversees the division of food, and even gives Katsuda, the head of the kitchen, a place at the table. His fairness and generosity have won over practically the whole ôoku sans the other concubines; Arikoto, ever the do-gooder, always searching for a way to help others, has stepped into a semi-managerial role. Meanwhile, Iemitsu’s advisors are worried because she’s allowing farmers to sell their fields in order to prevent problems while her daughter grows up. One of them jokingly suggests that, since the merchants are passing the family business to their daughters, women should become the heirs of the samurai families. Secretly, one of the advisors, Matsudaira (TANDA Yasunori) actually has a daughter, Shizu, whom he and his wife are passing off as their son who died of the pox. Meanwhile, Sutezo (KUBOTA Masataka) visits baby Chiyo, with whom he is quite enchanted, and Iemitsu gives him the name “Oraku” (お楽) to suit his carefree personality. Whereas Arikoto was annoyed that Iemitsu wanted to call him a “woman’s name” (Oman) as part of her power play, Oraku is touched, saying that just having their daughter is enough. Just as Oraku is about to (possibly) confess his love to Iemitsu, Arikoto arrives. As Oraku leaves, he excitedly tells Arikoto about his new name. Arikoto and Iemitsu look at the baby together, and she takes his hand, saying that he’s the only one for her. Oraku wakes up from a nap in the sun (of course) and Kasuga encourages him to “make sure” the next child is a boy, not a girl. He happily bounds over to a persimmon tree in the garden and jumps for a fruit he can’t reach, but something goes wrong mid-air and he hits his on a rock, partially paralyzing himself. Arikoto visits and makes sure he’s well cared for. Because Oraku is out of commission, Kasuga allows Iemitsu to reunite with Arikoto. They reignite their affair for three months, but Iemitsu does not become pregnant. Since no one knows that Iemitsu is actually a woman, Masakatsu (HIRAYAMA Hiroyuki) dons a mask to pretend to be the Shogun for an appointment with a young samurai who has reached adulthood–his own son, Masanori. He tells the young man that he knew his father, who would have been proud of him, and to take care of his mother and siblings. 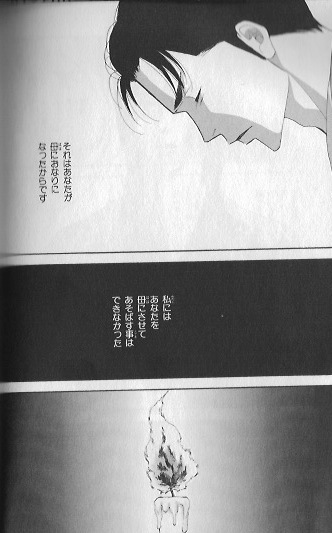 Masanori relates the story to Oyuki (his mother/Masakatsu’s wife). Masakatsu is alone in his hidden room when Kasuga comes to tell him to never pull a stunt like that again. Oraku’s accident is treated as unfortunate in the manga, but in the drama, the accident takes on a horribly cartoonish, unfunny tone that cheapens the freak-accident nature of the event. In the manga, Oraku slips off the corridor and hits his head on a rock in the garden. In the drama, he jumps to pick a high-hanging persimmon off a tree in the garden, echoing his introductory scene, but he fails at landing, hitting his head on a rock. We see the incident in slow-motion, and instead of coming off as dramatic, the cuts between the rock and his flailing fall just seem overdramatic. I get that Oraku is sort of a goofy character, but there was nothing wrong with the original scene; the cinematography and the change in events (which added nothing) took me out of the drama. Plot twist: Matsudaira’s effeminate son is actually a girl. I think I liked this plotline better when his child was a boy, if only because it showed how social constructions of gender were in flux, and also because there were other daimyô with cross-dressing heirs already. Also, the Masakatsu subplot is an addition for the drama. I like that we get to see more of his story. Next time on Ôoku: Kasuga does not support female daimyô.